The White Dog Wavespell is the 14th wavespell of the Dreamspell Journey. This wavespell is the second one of the Yellow Southern Castle of Giving, which is the fourth Castle of the Dreamspell Count. 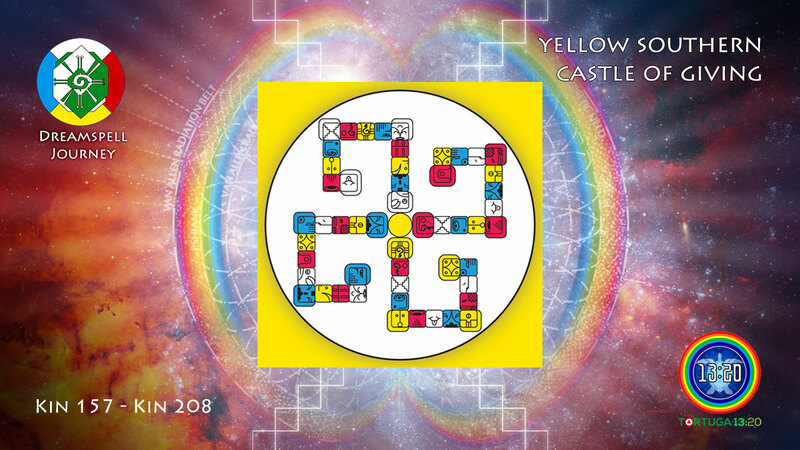 The Yellow Castle of Giving represents the Court of Intelligence and it covers 4 Wavespells (Red Earth, White Dog, Blue Night, Yellow Warrior) from Kin 157 until Kin 208. Through Giving, the planetary kin attain the Power of Ascending. In the Dreamspell transcreation, the solar seal of “Dog” is inspired onthe Mayan glyph of “Ok” (Oc) which exactly signifies “Dog” and it represents “Guide, Friendship, Fidelity”. The glyph of Ok is associated with colour white. In Maya Cosmology, the dog is an animal totem who guides the Nocturnal Sun (Jaguar) during its night passage through the Underworld of Xibalba, in order to ensure the next sunrise which represents the Resurrection of the Sun. The Maya believed that the sun died in the sunset and that it entered the Xibalba Underworld as a Jaguar (nocturnal sun). The archetypal Maya dog is the guide of the nocturnal sun and it helps to bring the next sunrise. The dog also guides the dead humans in Xibalba, in order to ensure their passage towards the 13 Heavens. In the Dreamspell, the White Dog is the Solar Seal number 10 and it is also associated with colour “White”, being part of the “White Root Race” of the “Spiritual Refiners”. The White Dog has the action of “Loving”, the essence of “Loyalty” and the “Power of Heart”. All of these attributes relate to the original Maya meaning of “Ok” because “friendship and fidelity” essentially represent “love and loyalty”. On the other hand, the Power of Heart is coherent with the victory of the dog as the guide of the Nocturnal Sun in Xibalba. Therefore, the great teaching is that Love and Loyalty transcend Death.